It is with great sadness that we share the news that Michael's mother, Etheline Cordray, has died. She was a vibrant and always busy lady who passed away after just 3 weeks in the hospital. Many of you may have met her or seen her as she went back and forth on the John Deere gator from her house next door to ours. Last year during alligator season, she said for us to call her over when a big one came in. We called her for a HUGE one. This was the big gator that was shown on CNN. 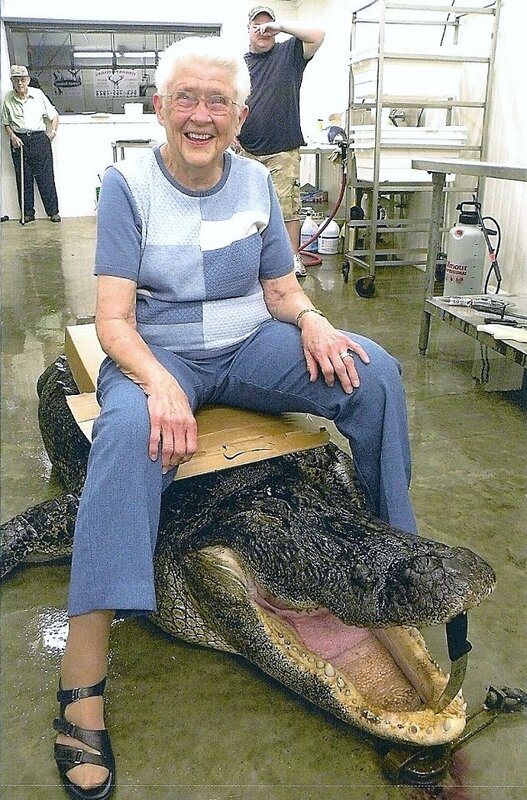 They didn't choose to publish Grandma's photo, but she got such a kick out of showing this photo of her sitting on that a big ole gator. So today say a little prayer for us as we try to hold on to the memory of good and happy times with Mrs. Etheline.